Click here to learn more about the #DemandtheSupply campaign. For decades, activists and affected communities in the Democratic Republic of Congo have called attention to the links between their country’s minerals and its protracted armed conflicts. To many communities historically impacted by the violence and lawlessness surrounding Congo’s gold, tin, tungsten, and tantalum mines, the need for change is clear. 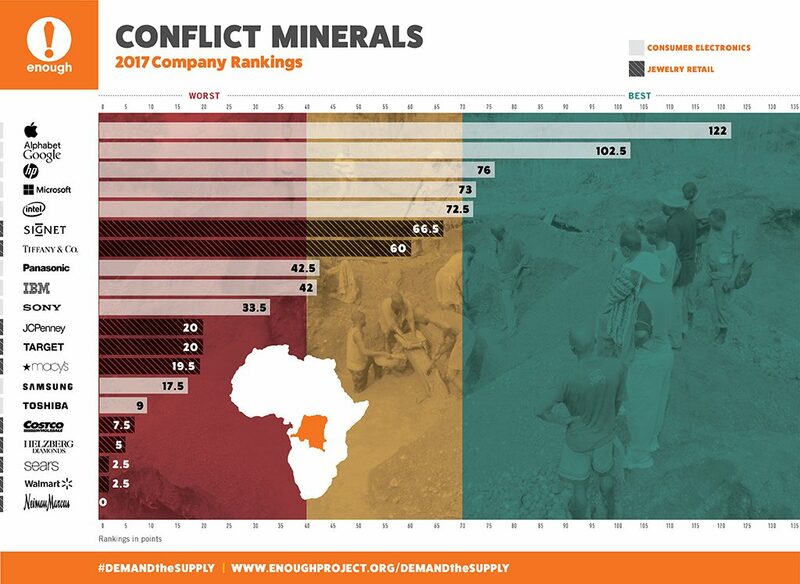 Graphic: A higher score indicates the company is making more progress on sourcing conflict-free minerals from Congo, while a lower score indicates little or no progress. The colored backgrounds in the graphic also break up the companies into tiers – ‘green’ being the best grouping ‘yellow’ in the middle, and ‘red’ the worst. Learn more about how companies were scored in the company response annex. 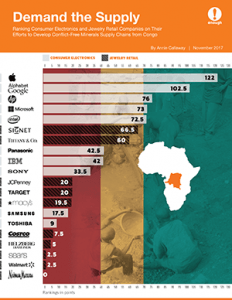 The results of these rankings indicate that top-scoring companies are enhancing their efforts with regard to sourcing conflict-free minerals from Congo; and progress in Congo’s mining areas demonstrates tangible impact to which company efforts contribute. Conflict minerals have never been the only source of income or motivation for armed groups. However, the regulation of the minerals trade as a result of pressure from end-user companies and other stakeholders has contributed to a significant decrease in violence and exploitation in mining areas. At the same time, companies and industries must be held accountable to ensure progress continues, and these rankings serve as a tool for consumers and investors to do that. Violence has not completely disappeared from mining areas in Congo. Even if that were to happen, there would still be a range of issues to address—including support for alternative livelihoods and anti-smuggling mechanisms—before a conflict-free minerals trade in Congo would be able to flourish. Enough’s 2017 rankings update companies as well as consumers, investors, policymakers, and Congolese communities on the state of play with regard to conflict-free sourcing efforts. It is important to note that the report does not examine or evaluate the ranked companies’ policies or practices with regard to any issues beyond conflict minerals from Congo. In other words, a high score in these rankings does not necessarily correlate with a company being responsible with their labor or environmental practices, or any of the other myriad of important issues that, along with conflict minerals, populate the broad universe of business and human rights standards. 1. Improve and support public reporting on supply chain due diligence. All companies, including publicly traded, privately held, U.S. and foreign companies, using 3TG minerals should conduct supply chain due diligence in accordance with the Organisation for Economic Cooperation and Development (OECD) Due Diligence Guidance, and report publicly on that due diligence through their websites and according to any applicable legal requirements. Companies bound by the Securities and Exchange Commission’s (SEC) Conflict Minerals Rule in particular should continue to file their Conflict Minerals Reports, and improve that reporting by describing their specific supply chain due diligence practices in detail, listing their smelters and/or refiners and highlighting any innovative ways they have gone beyond the bounds of the law to support a conflict-free minerals market. 2. Conduct continuous due diligence, not just annual reporting. Companies should consider due diligence a continuous, year-round endeavor that will become easier and cheaper with time, but will never be complete and should be focused on making steady improvement in areas where risk mitigation remains necessary. 3. Engage in multistakeholder initiatives to design and support progressive initiatives. With the laws mandating conflict minerals reporting continually under threat of being repealed or undermined, it is critical for companies to begin or renew their engagement with multistakeholder initiatives in order to ensure the momentum built up since Dodd-Frank 1502’s passage will continue. 4. Support conflict-free sourcing opportunities and livelihood opportunities in mining communities with financial investment and public support. Conflict-free sourcing initiatives with strong traceability and assurance systems, particularly in the artisanal mining sectors in Congo, need investment. Companies can make an important impact by making financial contributions, improving their awareness of the challenges and opportunities related to developing conflict-free sourcing opportunities and livelihoods, and increasing public awareness of the need for these initiatives. 5. Set the bar higher. With supply chain transparency and in-region engagement improving, opportunities to set the bar higher and fill remaining gaps have emerged. Companies should ensure, for example, that their due diligence and risk assessment includes specific attention to mining in national parks in Congo and the wider region, given the unique proliferation, collateral damage, and rule of law challenges specific to mining and armed group activity in national parks.